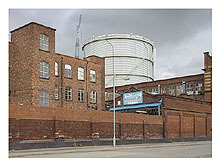 IT'S NEARLY THE END OF THE ROAD for the gasometer at Bradford, in April 2000 being dismantled, and seen here from Cambrian St and Upper Helena Street, off Ashton New Road. Coal gas became widely used in the early 19th century, and provided heat, light and power for homes, factories, and hospitals. In the 1960's natural gas replaced coal gas and equipment was converted for the lighter, odourless methane gas from under the North Sea. Many facilities designed for coal gas continued to be used for natural gas. After privatisation of utilities including water and gas, a company called Transco took over responsibility for piping and processing gas. 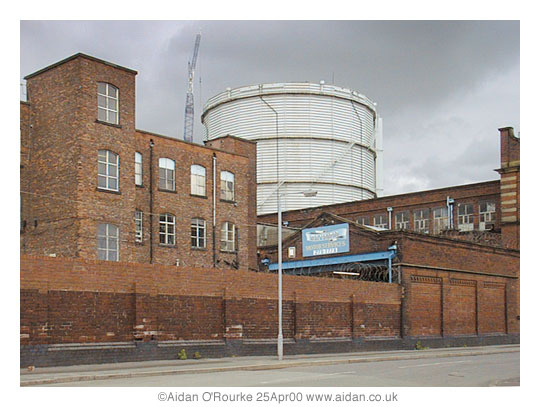 In the late 1990's they decided to remove many of the old gasometers and gas cylinders, once an dismal, but familiar and atmospheric feature of British townscapes. Another reason to demolish this huge cylindrical structure is the close proximity of the Commonwealth Games site, which is just across the railway tracks from here. BOGGART HOLE CLOUGH is a large, densely wooded park just three miles north of Manchester city centre. Here, a stream flows through a wooded hollow - it's April, so the trees are still mostly without leaves, though greenery is just starting to appear. The park is sadly under-used, poorly maintained and in places, strewn with rubbish. Once a team of 20 or more gardeners took care of Boggart Hole Clough but in the 1980's staff levels were cut to one or two men. 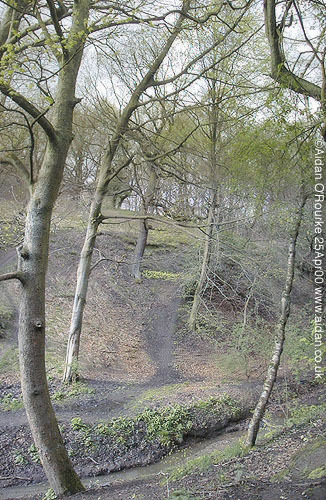 Thanks to the Commonwealth Games, and maybe Lottery funding, Boggart Hole Clough will be restored. The sports centre is to be used for the 2002 Games. Hopefully more local people will visit, enjoying a facility that people in crowded cities such as Tokyo and Bangkok can only dream about. 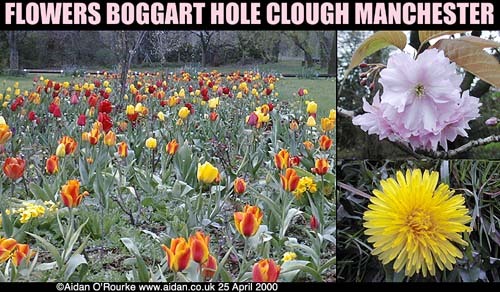 BOGGART HOLE CLOUGH contains many beautiful flowers, including those planted by gardeners - the tulips on the left provide a welcome splash of colour next to the car park. There are also many wild flowers and spring blossoms. Round April and May, many grassy areas are speckled with yellow daisies, like the one on the left. Trees are laden with flowers whose delicate petals will soon fall to the ground, like a spring snow storm. 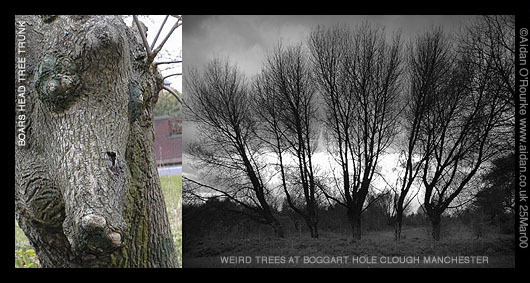 YOU'D EXPECT A PARK NAMED Boggart Hole Clough to be a bit spooky - The word "Boggart" is related to "bogle" or "bogey man" - meaning an evil spirit, goblin or even The Devil himself. Just near the car park on Charlestown Road is a tree trunk shaped like a boar's head - a man walking his dog drew my attention to it. "If you want to take a picture of something unusual, have a look at this..."
The five trees splayed out like fingers against the leaden north Manchester sky are pretty spooky as well. I wonder if the Boggart roams through the woods and glades at night, surveying his domain... I think I'd rather not find out!